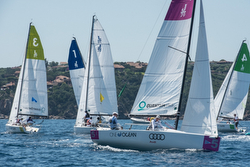 (Porto Cervo, Sardinia)- The AUDI Invitational Team Racing Challenge kicked-off on June 21st- the Summer Solstice- for four days of racing on the emerald green and blue waters off Porto Cervo. 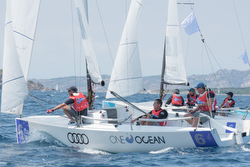 The Yacht Club Costa Smeralda, with the support of title sponsor AUDI, hosted the event. 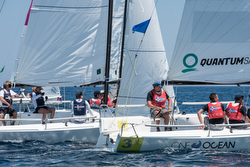 The biennial regatta took place aboard the YCCS fleet of J/70 one-design sailboats using the "team racing" formula in which a total of four boats race at one time- two boats representing each team with 3 crew on board. The teams compete in a series of short, fast races that emphasize teamwork between the crews. Most importantly, in the 2x2 format, last loses! Making for some incredibly dramatic attempts at “pass-backs” in the absolute latest stages of any race! 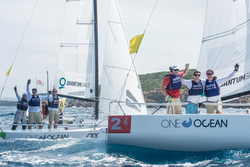 Seven teams sailed the third edition of the event, including the Newport Harbor YC from California, winner of the 2016 edition. Also sailing were teams from Gamla Stans Yacht Sallskap from Sweden; Eastern Yacht Club, Newport Harbor YC, and the New York Yacht Club from the USA; and the United Kingdom’s Royal Yacht Squadron and Royal Thames YC. 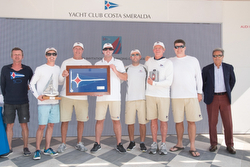 The YC Costa Smeralda Team Racing crew represented the home team. YCCS Commodore Riccardo Bonadeo commented on the inter-club event, "I am particularly pleased to welcome these teams who have travelled from countries as far away as Sweden, the United States and England to come to Porto Cervo for three days of thrilling racing. We are looking forward to seeing some great sportsmanship with crews competing to defend the honours of their respective Clubs. And finally, I would like to thank our home team flying the YCCS colors, led by Antonio Sodo Migliori and Edoardo Mancinelli Scotti." The first day was characterized by light wind. The host team from YCCS sat atop the fleet, followed by Newport Harbor Yacht Club and in third place, tied on points, were the two American teams- Eastern Yacht Club and New York Yacht Club. After an initial postponement of the first starting signal due to light winds, the Race Committee got racing started at approximately 13.30 on the regatta course in front of Porto Cervo Marina. The seven teams managed to complete the first round robin. Opening racing was the YCCS team, headed, respectively, by Antonio Sodo Migliori and Edoardo Mancinelli Scotti. They sailed fast and smart, claiming victory in all six of the races they sailed. The Americans dominated second and third place in the standings; with Newport Harbor YC (skippers Justin Law and Mac Mace) leading Eastern YC (skippers Spencer Powers and Stein Skaane) and New York YC (captained by Brian Doyle and Will Graves). Filippo Maria Molinari, Team Captain of YCCS, commented, "We've given all the participating teams a good welcome. We were able to win all our races today and we are, of course, pleased. There is a little more wind forecast for tomorrow. Today, we had very light conditions, 7-8 knots up to 10, but the day was very pleasant. Most likely, we are at an advantage because we have a light crew, we'll see what happens in the next few days with stronger wind." A somewhat prophetic point of view from Sr. Molinari! The second day of racing started as scheduled. Accompanied by a westerly wind of varying intensity, racing started as scheduled at 1130 hrs. At approximately 1500 hrs, as the breeze dropped out, racing was halted for an hour until the westerly wind built back up to 12-15 knots. This allowed the teams to complete the second round robin of the regatta with a total of 50 races run so far. With a perfect scorecard of 8 wins out of 8 races, the Newport Harbor YC team led by Justin Law and Mac Mace took control of the provisional classification. The host team from YCCS (skippers Antonio Sodo Migliori and Edoardo Mancinelli Scotti) posted 6 wins out of a possible 8, now sat in second place. The New York YC team pulled away from Eastern YC by a delta of two points, and now sits in third place in the standings. Dave Clark, Commodore of Newport Harbor YC, who was participating as a crew member on their team, commented, "The event has exceeded our expectations, the organization, the race committee, sponsors and all the staff have been perfect. We're having fun and we're also racing well!" Skipper Justin Law added, "It was a fantastic day, we started at 1130 hrs on the dot and apart from the drop in wind in the middle of the day, everything was perfect. We can't wait to race again tomorrow!" Day Three- NHYC Victorious, Again! The final day saw Newport Harbor YC clinch victory ahead of the YC Costa Smeralda (YCCS). After the morning briefing at 0900 hrs, the YCCS Race Committee went out on the water to assess whether conditions would permit the scheduled start for the day. After observing conditions of 1.5 meter waves and 18-25 knots of westerly wind, the YCCS PRO postponed sailing until the breeze settled around 1500 hrs. The finalists then proceeded with racing to decide the top podium finishers. Newport Harbor YC (Justin Law and Mac Mace) faced the home team from YCCS (Antonio Sodo Migliori and Edoardo Mancinelli Scotti) to do battle for first and second place. Winning two of their three races earned the Americans the championship. Eastern YC (Spencer Powers and Stein Skaane) then sailed against the New York YC (Brian Doyle and Will Graves) in a fight for third place, with NYYC taking the third on countback to their earlier round robin results. Justin Law, skipper of Newport Harbor YC, commented on his team's victory, "A fantastic day, the YC Costa Smeralda Race Committee did a great job, they were patient and waited for the wind to die down and made the regatta happen. A big THANK YOU goes to my team mates for making this victory possible!" All teams received the YCCS Burgee as a memento of the event and the winners from Newport Harbor Yacht Club were also awarded a Garmin inReach Explorer+ that can be used to send and receive text messages and e-mails in any part of the globe. For more information on the YC Costa Smeralda 2x2 J/70 Team Race event, please contact - Marialisa Panu- Tel. +39 0789 902223/ email- pressoffice@yccs.it / website- http://www.yccs.com Add to Flipboard Magazine.